So, you’ve done some thinking, read Bernedoodles: A Head to Tail Guide, joined the Facebook Group, and checked in with some owners. ​You’ve decided that a Bernedoodle is the right dog for you. ​You’ve realized how important an experienced and knowledgeable breeder can be, especially with a hybrid, where there can be considerable variation within and across litters. The size, coat type, temperament and energy level may differ significantly among siblings. 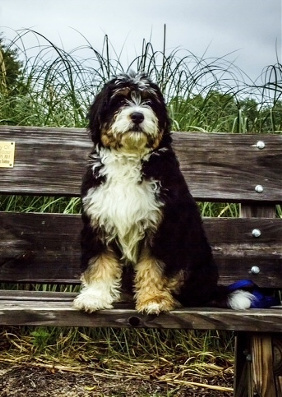 While it is always important to buy a puppy from a professional breeder, in the case of a hybrid like the Bernedoodle, it’s even more critical to have an expert’s help. Breeders who have spent years watching hybrid dogs develop can usually predict with reasonable accuracy how a puppy is likely to turn out. Without that professional guidance, you will get surprises—not all of them welcome. ​What’s more, you’ve realized you want a community of like-minded owners that will be there to offer help and support and share varied experiences. Fill out the the Adoption form, which you’ll find on the Puppy’s menu tab here. Tell us about your home and family, and describe your plans to care for and train your Bernedoodle. State your preferences about size, gender, type of coat and coloring—but do try to keep an open mind. The pup with the perfect temperament for you may be the opposite of what you originally had in mind! Wait. If you are flexible on color, gender and coat type, the wait may not be that long. If you’ve provided a long list of specifications, including a tri-color coat, you had better find some distractions, because this could take awhile. Join the Facebook Group, if you haven’t already. This is the very best way to spend your time while you are waiting. By the time your pup arrives, you will have gained a huge amount of knowledge from people in the puppy trenches, and you may even find other SwissRidge owners who live near you, and set up some play-dates. Check in with us once in a while to see where you are on the list, and what litters are planned, so you can get a rough idea for timing your pup’s arrival. Keep in mind that Bernese are notoriously difficult to breed, litter size varies, and it’s very difficult to predict how many puppies I’ll produce in a given year. Revisit your decisions. You might be surprised at how many people change their minds about size and coloring during their wait. Some people grow so impatient for a puppy that they opt for a Goldendoodle first, and continue to wait for a Bernedoodle. If you haven’t already made plans to enroll your puppy in our imprinting program, now is the time to make a final decision. Leave your pup with us for an extra month, and we’ll get things on track for you. By the time your pup arrives home at 12 weeks, it will be used to its crate, have a strong base in puppy manners, and be well on the way to being housebroken. That means you’ll be well rested and ready to welcome a more mature puppy. You can read more about the imprinting program in the Training section. When a litter is about 5-6 weeks old, we reconfirm with you that you’re ready for your pup, and then book flights and forward flight information. Eight long weeks will pass, in which you prepare, worry and stare at the photos we post at birth, four weeks and seven weeks. You may send me your preferences within the litter, and where there is some flexibility, I try to take your requests into account. But I will always—always!— choose the puppy whose temperament I think best suits your circumstances, regardless of appearance. When the litter is seven weeks old, I perform the Volhard Puppy Aptitude Test, which you can read more about in the Question and Answer section. I consider the results, paired with my own observations of how the pups have been interacting with their moms, their littermates and their caregivers. With that information in hand, l review completed applications and decide what puppy in the litter best suits your circumstances. Usually, I make these decisions on the Tuesday or Wednesday before the weekend scheduled for pick up. I delay this decision not to torment you, but to be sure I have the most information available on the pups to make the best matches. Puppies change so rapidly at this stage that every day counts. It’s “my process,” and it works. Check the testimonials if you doubt. We will send you an e-mail and description of the pup or pups that I think will work best for you. You may accept the pup, or decide to pass on it and defer your deposit to a future litter. You accept your puppy, and immediately post about it on Facebook, trying not to gloat that yours is the cutest and best of the litter—or of all the litters. It is the best pup… for you! More than half of every litter is shipped across North America. You can read more about shipping in the Q and A, but I firmly believe that flying is safe for pups, and in fact, is preferable to very long drives. Puppy pick up day! These are the very best days for me. I encourage anyone who can make the journey to pick up their pup in person—if only so that I can see your face when the puppy arrives in your arms. We hold orientation sessions at the kennel, where you will get a chance to mingle with me, and usually other owners. I will give you lots of tips and demonstrate a simple command or two. I used to do the information session after giving people their puppies, but I realized new owners were too entranced to pay attention. So now I’ve reversed that. Before I bring out the pups, I spend about an hour sharing some insights into how to raise a puppy correctly from the start so that they’ll have the perfect dog down the road. I demonstrate the bonding exercise, as well as simple commands such as “leave it,” “sit,” “down,” “stand,” and “watch me.” And I cover the basics about caring for your Bernedoodle, crate training, potty training and much more. I always welcome questions, but since most people don’t realize what they don’t know until they’re in the puppy trenches, I send home an extensive information package with every SwissRidge puppy. We keep in touch—on Facebook, by e-mail, by phone if necessary. SwissRidge Kennels offers lifetime support for you and your dog. I want to hear how your puppy develops, and about any issues you face. Your input may shape future breeding decisions. So please keep me posted.